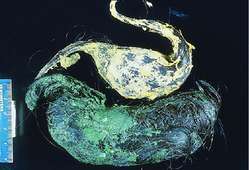 a mass formed in the stomach by compaction of ingested material that does not pass into the intestine. A concretion formed in the alimentary canal of animals, and occasionally humans; formerly considered to be a useful medicine with magical properties and apparently still used for this purpose in some countries; according to the substance forming the ball, may be termed trichobezoar (hairball), trichophytobezoar (hair and vegetable fiber mixed), or phytobezoar (food ball). /be·zoar/ (be´zor) a concretion of foreign material found in the gastrointestinal or urinary tract. a hard ball of hair or vegetable fiber that may develop within the stomach of humans. More often it is found in the stomachs of ruminants. In some societies it was formerly considered a useful medicine and possessed of certain magical properties. It is apparently still used as a therapeutic and mystical device by some, especially in the Far East. A concretion formed in the alimentary canal of animals, and occasionally humans; formerly considered to be a useful medicine with magical properties and apparently still used for this purpose in some places; according to the substance forming the ball, may be termed trichobezoar (hairball), trichophytobezoar (hair and vegetable fiber mixed), or phytobezoar (foodball). A ball of hair and other material forming in the stomach or intestine and rare in the psychologically normal. In more gullible times bezoars have been valued for their magical properties. a mass formed in the stomach by compaction of repeatedly ingested material that does not pass into the intestine. See also phytobezoar, trichobezoar.